Tigger is a huge fan of the Thomas & Friends Take-n-Play range of toys from Fisher Price, so much so that if I took away all his toys apart from these I don’t think he would notice. The Take-n-Play Shark Exhibit Playset is one of the most recent additions to the range and Tigger was lucky enough to be sent one for review. If you are not familiar with Take-n-Play playsets the idea of them is that they are a foldaway track that can be played with at home or out and about. This particular playset pulls apart and the track drops down in order for the child to either connect additional playsets or simply pop Thomas on and enjoy. Holding onto either side of the playset simply pull apart until the internal track falls forward, ensure that the top track (shark side) has located over the top of the lower track. Pull back the sharks head and place Thomas on the track inside it’s mouth, then tap the sharks nose and he will start to close. 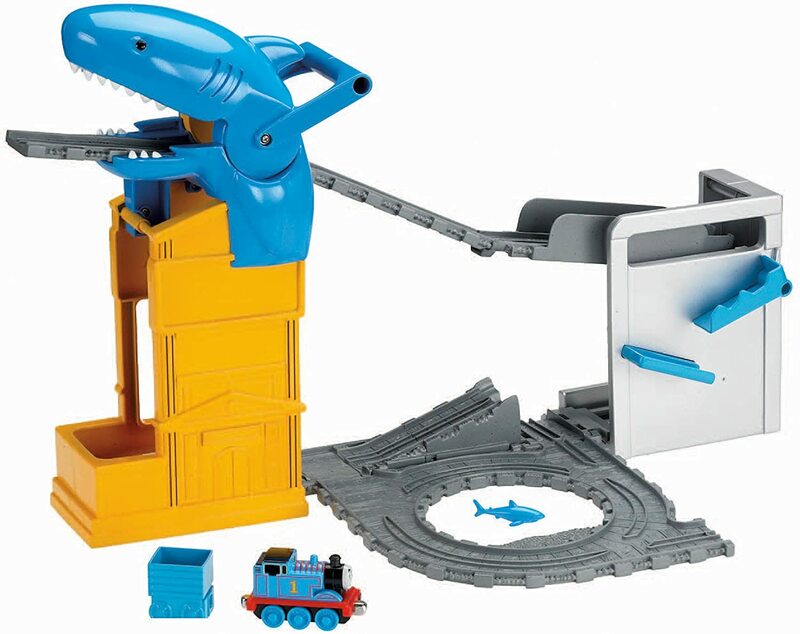 Once the sharks mouth has closed Thomas will shoot out the back and down the track, bouncing off the end and sliding backwards down the track as the lower track lowers to the bottom. As Tigger has a couple of the Take-n-Play playsets I had great hopes for this set, however I have to say as a parent I was disappointed. Pulling the track part is relatively easy however putting it away can be tricky as you have to hold the fold out track up as you slide the two sides together, whilst ensuring that the top track doesn’t get caught on the lower one. Also when the playset is unfolded it is difficult to ensure that the top tracks are in-line. The upper track behind the sharks head has a habit of falling off, I’m not too sure is this a design fault or whether it is just not suitable for more than one train to travel on it at a time. It is easily popped back into place but when you have done it more than two or three times it soon becomes annoying. Tigger on the other hand loves it and can often be found trying to squeeze as may trains through the shark’s mouth as possible and then laughing when they get stuck. The foldout section of the playset hardly ever sees a train as he prefers to watch the trains and trucks cascade down the upper track. Disclosure Policy: We received the Thomas & Friends Take-N-Play Shark Exhibit Playset FOC for the purpose of review.